Community-owned, not-for-profit public power utilities power homes and businesses in 2,000 communities — from small towns to large cities. They safely provide reliable, low-cost electricity to more than 49 million Americans, while protecting the environment. Public power utilities serve customers in 49 states —all except Hawaii — and the territories of American Samoa, Guam, Northern Mariana Islands, Puerto Rico, and the U.S. Virgin Islands. Public power supports local commerce, employs 93,000 people in hometown jobs, and invests more than $2 billion annually directly back into the community. Most public power utilities have fewer than 4,000 customers, and collectively, these utilities serve 1 in 7 electricity customers across the U.S.
Citizen-owned public power utilities first appeared more than 100 years ago when communities created electric utilities to provide light and power to their citizens. The number of public power utilities has grown from fewer than a dozen in 1890 to nearly 2,000 today. While many utilities were sold to large corporations during the 20th century, others chose to preserve community ownership and local control of their power supply. Some communities previously served by private utilities have formed a public power utility. Public power utilities often have to fight to keep their communities powered affordably and reliably (Association members can download the guidebook, Positioning Your Community to Succeed in Sellout Evaluation). A sea of often conflicting laws and regulations can constrain power supply sources and increase costs. For decades, public power utilities fought for the right to access wholesale power from federal dams at cost. Today, public power continues to push for effective competition in wholesale electric markets so they can get power at reasonable rates for their customers. In the 1950s, public power utilities within the same state or region moved toward joint ownership of power supply resources. The joint action movement has contributed to the continued success of public power and played an important role in advancing nuclear generation in the U.S.
Like public schools and libraries, public power utilities are owned by the community and run as a division of local government. These utilities are governed by a local city council or an elected or appointed board. Community citizens have a direct voice in utility decisions and policymaking. Business is conducted in the open and citizens know where their power comes from and how and why decisions affecting their utility bills are made. In general, a governing body — a city council or independent utility board — has authority over a public power utility’s retail rates. In some states, and in certain circumstances, a state regulatory commission may have jurisdiction. State regulatory commissions fully regulate public utility rates in Indiana, Maine, Maryland, Rhode Island, Vermont, and Wisconsin. Commissions regulate rates for services offered outside of municipal limits in Colorado, Kansas, Mississippi, New Hampshire, New Jersey, Pennsylvania, South Carolina, and Wyoming. 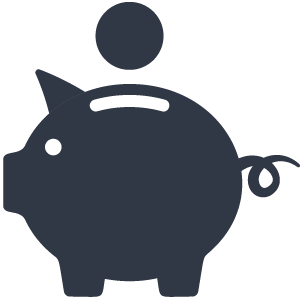 Commissions regulate rates only under specific conditions in Alaska, Florida, Louisiana, Massachusetts, New Mexico, New York, Texas, and West Virginia. Learn about the types of governing bodies that oversee public power utilities, their scope of authority and responsibilities, and the term limits and compensation of governing body members. Public power utilities are not-for-profit entities that provide electricity to customers at the lowest rates. Homes powered by public power utilities pay nearly 15 percent less than homes powered by private utilities. Businesses that get electricity from public power utilities also pay less than businesses that get electricity from private utilities. Customers of public power utilities lose power less often. Customers of a public power utility are likely to be without power for just 59 minutes a year, compared to customers of private utilities that may lose power for 133 minutes a year — provided there are no major adverse events. Public power generates 10 percent of all electricity in the U.S. and distributes — or sells at the retail level — 15 percent of all power flowing to homes and businesses. Public power utilities buy or generate electricity from natural gas, coal, and nuclear, as well as renewable energy sources such as solar, water, and wind. 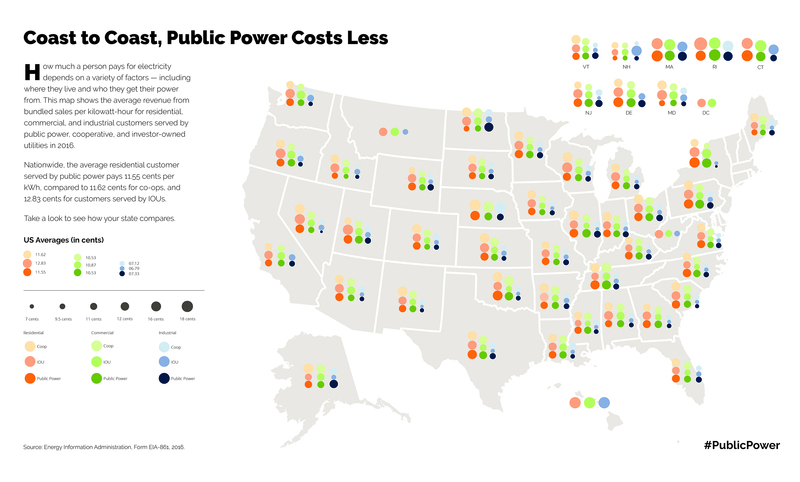 In several regions, public power utilities can buy wholesale hydropower generated from federal dams at cost and pass the savings on to customers. Across the country, public power utilities buy wholesale electricity and other services through joint action agencies to leverage economies of scale and strength in numbers. When customers are the utility’s shareholders, serving the community is the utility’s top priority. Public power utilities are embedded into the fabric of their communities and support a range of community programs including charitable, educational, and beautification programs. Each dollar of a public power utility employee’s paycheck circulates through the community an estimated five times. On average, public power utilities pay 5.6 percent of electric operating revenues back to the community — through taxes, fees, and special services. Public power gives 33 percent more back to the community than private utilities. Public power infrastructure projects — such as new generation equipment, transmission lines, and distribution system upgrades — are often funded through the issue of tax-exempt municipal bonds. Funding through municipal bonds means community members invest in their electricity infrastructure and receive interest as public power utilities pay back the loan.